If you want people to find you on the Internet you have to write to people who are searching for what you are writing about. That's a lot easier to do when you know what people are searching for. People use certain words to search – and there are tools that track everything you could possibly need to know about those keywords. I use the best keyword ranking tools I can find – and I am always looking for (and finding) better ways to do keyword research. Good keyword research drills down and finds the keywords that are searched often and often overlooked by the authority websites because they get less searches a month than the big dogs are interested in. Be the little dog. 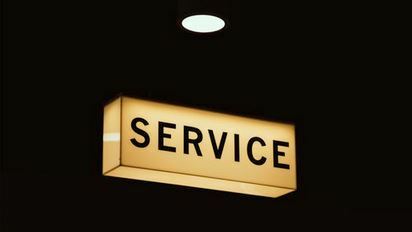 Serve the people who are not getting good content from the big dogs. Always go into keyword research like you should a business… how can I serve you. How can I help someone see that what I have can help them? When you write, think about how you can help someone the most. Never think, what can I sell this person. It's always how can I help them the most. Free training and free keyword tools are out there. There are also keyword tools and training that cost money -and sometimes it's worth it to pay something – and get something more. 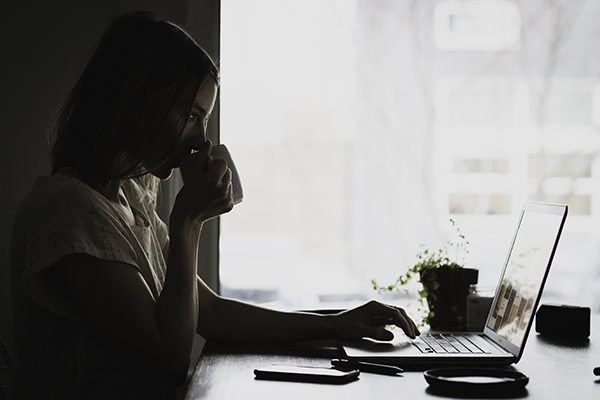 There are plenty of scams out there – so find someone (or a group of people) you trust — already doing what you want to do and ask questions – especially before big purchases. If you are not getting traffic you may need to do better keyword research, which this post will help you do with video tutorials and step-by-step instructions where needed. These keyword tools are mostly free – I will explain why I say mostly right up front. Jaaxy Starter – Free to anyone – 30 Keyword searches a month. These can go quick. I went over Jaaxy Lite in some detail in these 2 posts. What is Jaaxy – Keyword Tool? Jaaxy is a great tool with a lot of features for keyword research, checking your competition and checking your rank and if you haven't seen the video What is Jaaxy Keyword Tool – here it is again. SeoBook stopped working on FireFox when I updated to version 57 – that update came out on November 14, 2017 – and it took me this long to research why I could not use their keyword tools anymore. At first, I just figured like most free keyword research tools – they had stopped working and that was the end of it. I didn't think to look for a fix. I just started a new site at Free Training Work From Home on March 12th, 2018 and I was getting frustrated with not having more information than – you are not found in the top 100 of Google Ranking and I remembered how cool Rank Checker is – and I decided to look into why it was not working and see if I could fix it. Rank Checker checks your website's ranking on keywords you choose – up to at least the top 300 in Google, Yahoo and Bing search engines – I'll get back to how it works later. It's a great keyword tool. Create a free account on SeoBook– if you had an account before – they might have deleted it – I had to create a new one recently because my old one was deleted. According to SeoBook: They regularly clean out databases. They will send you an email with your username and password and a link to download your free tools. 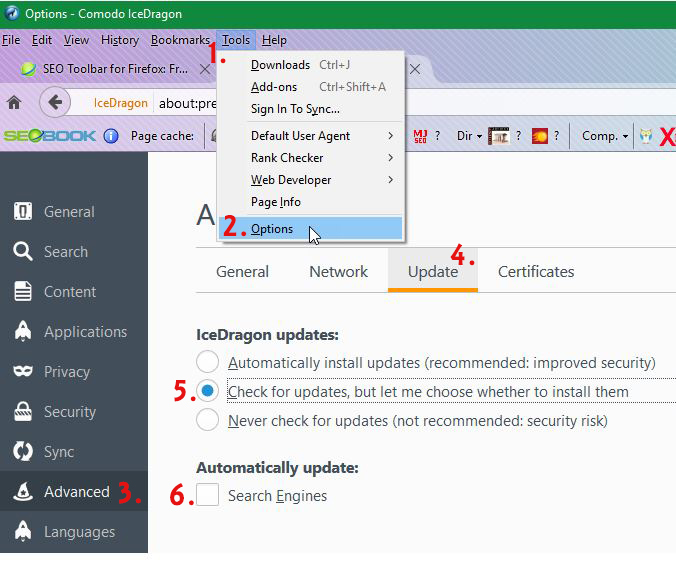 Download the browser Comodo Ice Dragon and return using that browser before you can download Rank Checker and the next keyword tool – SEO Toolbar. Disable automatic updates on this browser! This is very important and here are the instructions on how to disable the updates. This is so these tools don't stop working. 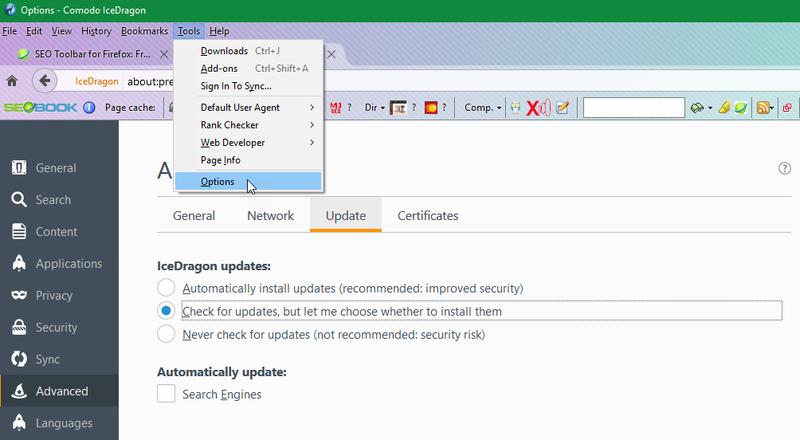 When I first downloaded the Comodo browser, there was no menu showing – the instructions on how to disable the automatic updates were showing a menu I did not have — and I was having a heck of a time finding out where to disable the automatic updates. File, Edit, History, Bookmarks, Tools, & Help were missing. I kept trying to go into that place on the right with the 3 lines because I was sure that would be where I would see something that could help me see this menu – but I could not find it in any of the choices in that menu. There are some great things to do in that window – the private window is like the “incognito” that Chrome offers – I like that since it is the only thing I still use Chrome for – I might just take Chrome out of my toolbar since Comodo does their own form of private browser viewing. When you right click on the home button – you see a dropdown menu – make sure “Menu Bar” is checked – and you should get back those menu items: File, Edit, etc. “Check for updates, but let me choose when to install them” is checked. 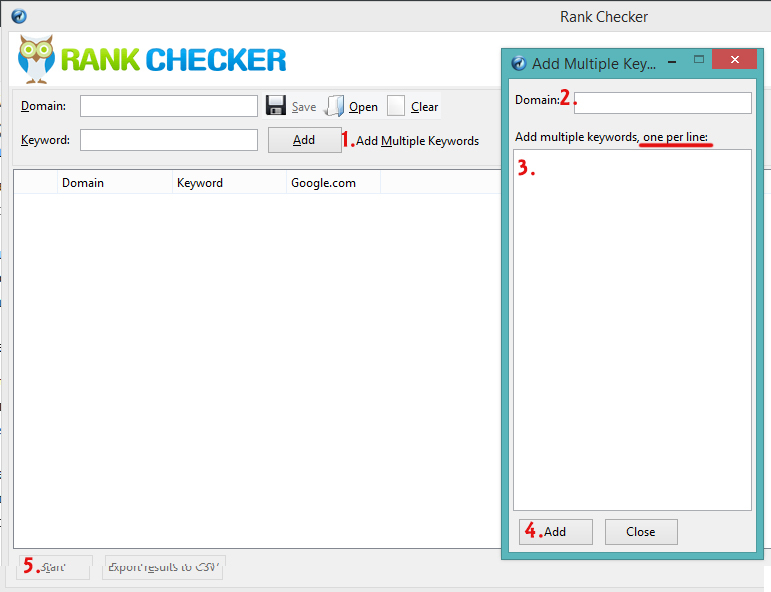 Now, FINALLY, you can get and use Rank Checker for free. You should already be on the download page with the Comodo browser if you aren't there yet & you need the link here it is – download Rank Checker and the owl should be in the menu choices when you are done. Anytime you want to use Rank Checker – you will have to open up the Comodo browser – so I created a shortcut on my desktop taskbar. All you have to do is drag the desktop shortcut down to the taskbar and create a shortcut on the taskbar. I have all the browsers and common tools I use in the task bar for quick access. All you have to do is put in the keywords you are looking to rank on – and the main domain and if you are found ranking in any of the search engines – on any page of your domain – it will tell you what your rank is and what page is ranking. It's a great tool to see how you are doing with your content marketing and keyword rankings. Hopefully, you have not left the SeoBook download free keyword tools page because there is one more tool to download for your new Comodo browser. It's a toolbar that is going to help you see how pages are doing with their own rankings. This will help you size up the competition, pick well respected blogs to comment on and check your own progress when doing things to improve your rankings. I was going to tell you all about the other free download on the SEOBook site because I used to use that with FireFox and that is SEOBook for Firefox – this tool is for use with Google search – when you do a search on Google and you want to size up the competition – you used to be able to see the stats for all the listings on Google. In the above snapshot of SEOBook for Firefox with the Comodo browser free training work from home was the search and this was the first result. Only a few of the fields are filling out – even though I went in “Options” and turned all of the fields to automatic. After a few tries with this free tool — Google sent me a Capcha – and then told me my browser is too old to do the Capcha. All of the fields should be filled out to give a full picture – very few are filled out – and this does not tell us much. If this is how this keyword ranking tool works with Comodo, I will not be using it. I have a similar tool I have been using with FireFox since SeoBook Google search tool broke last November. I like this tool – it's very useful for a quick glance of sizing up the competition in a Google search. You can get a site audit of any site – including your own – do comparisons to other sites which I will show you in this video – and I am going to go over some comparisons with some screenshots below the video. There are tons of other features too and it is available for several browsers, iphone and ipad. This video gives a walk through – using the tool in a Google search and on individual sites, as well as in the app / browser extension window – there is a lot of information and as you will see in the video – I don't know everything about all this info! If you want to learn more than me, read the guide at SEOQuake – where you can also download the browser extension. In the video, I compared the site that I was researching to my site and here is a snapshot of that information. I know Alexa goes by the lower the number, the better. SEMrush is also the lower number is better. I am not sure about Google index and Bing index – and in the video – I show my confusion! I think – the higher number is better? But not sure why my google index is so similar to the evolvingseo.com site I used in this example – because he has approximately 18,000 monthly visitors and I have less than organic 100 visitors per month because my site is brand new. Finally – these are sorted by SEMrush Rank – and you can see traffic is not completely dependent on this ranking – but it is better to be lower for sure! And it looks like Google index and Bing index are better if they are higher – but that is not always true either. Look at the site getting 23K visitors a month with a Google index of 265. One thing I find really interesting here are the 2 sites that are each getting 1,670 visitors per month. One has an SEMrush ranking over twice the other – but that one has way more backlinks than the other with the lower SEMrush score – so they are getting about the same traffic. That gives me hope that by building quality backlinks, I am getting closer to getting organic traffic from the search engines. UberSuggest was just acquired by Neil Patel in 2017 and I have started to hear people who talk about SEO and the tools that help us build online businesses – talk about UberSuggest. I like the info Neil puts out too- he's well respected within blogging communities. 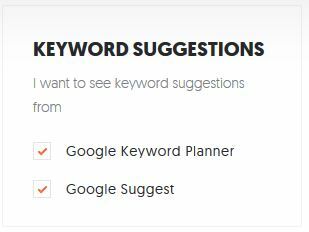 You are getting results from Google Keyword Planner – which has reverted to giving ranges for estimated traffic – but Ubersuggest gives real numbers and is easier to use – you don't need a Google Adwords account – and you do for Google Keyword Tool. So, when you do a search on Google and it comes up with suggestions? That's Google suggest, and you can go letter by letter and that is Alphabet Soup. I like the amount of suggestions UberSuggest gives and the fact that you get search volume with the results. I do have a lag time in my typing sometimes. I can type a whole keyword phrase and it takes two more minutes for it to appear in the box – and you could watch it type it out in slow-motion. Press “Look up” It's fairly quick to give results – I have only had a couple of error messages over a 30 day period where I have been using Ubersuggest almost daily. The PPC and competition are pretty much useless for websites that are using content marketing and keyword research/seo as a strategy – as the competition in this tool is PPC competition – which is much different from organic search engine competition. Search volume is universal but the competition in the paid ads and the organic results are completely different. I have been using Market Samurai for a long time – I can hardly remember a time without it! I first got this tool in 2008 for a one time price of $69 – you can still get Market Samurai for $97 ONE TIME – and it has been one of the best keyword ranking tools I have ever worked with. It's worth it's weight in gold. You can do keyword research and really drill down for low competition keywords using filters. When you think you have found a good one – just switch over to SEO Competition and check the competition. Green is good, yellow is caution, red is tough to beat. I am a visual person – so the color coding of the keyword research tool is really helpful to me. Here is a demo – it's a long video – longer than I like doing. I tried to cut out some of the long waits Market Samurai has. And I tried to get to the point and not spend too much time picking keywords. Normally, I would probably spend more time picking 3-5 keywords. In 45 minutes, I run through a couple of keyword suggestion layers and then pick a few words to do SEO Competition research on. Last, but not least, I add in my domain name, and you get a sneak peak at something I will be blogging about. My Trust Flow dropped 17 points! Sign up for email updates so you get emailed when that blog publishes. Remember earlier when we compared the 8 domains with SeoQuake that we know the amount of organic traffic they get? What is the Best Keyword Tool in 2018? I use all of these tools and it's a combination of these tools that gets me the keywords that I am most likely to rank in the search engines for. 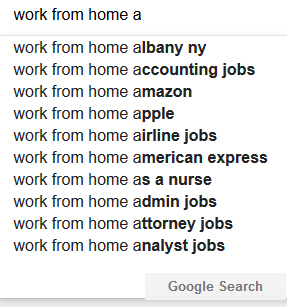 The “work from home” niche that I am writing in is very competitive. Keep putting out quality content – and we will get a share of the traffic – eventually. I will keep you up to date on how that goes!